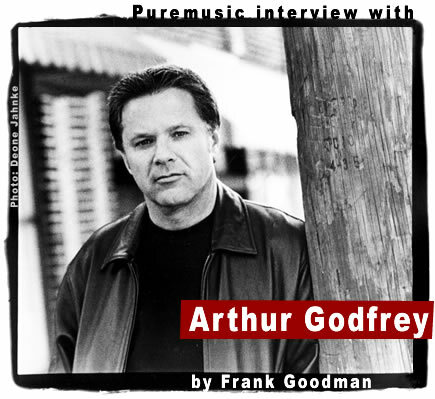 Our first interview with Arthur Godfrey was at the Folk Alliance 2002 in Jacksonville FL. He'd just won the John Lennon Songwriting Contest in the Folk category. We became friendly right away and ran into each other several times in the year to come and played a few shows together, either in CA or Nashville. Arthur subsequently moved to Nashville. He'd had his CA cohorts play his first Nashville appearance or two, as well as the wrap party for Sean Penn and the cast and crew of 21 Grams in Albuquerque. After that, I started filling in on bass for him at a few shows as he got his name around town a bit. In the spring of 2004, he asked if I wanted to go play some dates as a duo in the Northeast and in NYC, that I could open most of the shows as well. I inquired whether it was a Sean thing, and he said, yeah, that Sean was shooting The Interpreter with Nicole Kidman and Catherine Keener, to be directed by Sydney Pollack, in the city. Talk about a no brainer. We played a few cool shows on the way up, but the best was playing for Tim Shriver and his wife Linda at a house concert. [Tim is the son of Eunice and Sargent Shriver, brother of Maria. He's long been the director of The Special Olympics, which was founded by his mother. His dad founded the Peace Corps.] They were absolutely stellar people, and their children were likewise very special, with grace and equanimity down to the youngest. Naturally, they had a bunch of very interesting friends, and we all had a great time and a very good show. We even hung out at his folks' place and talked with them at the pool, and looked through a remarkable collection of presidential memorabilia of John Kennedy, dating back to his letters from school, his drawings, even personal diary entries on very significant days in American history, all framed on the walls of their beautiful home. Everyone we met was very down to earth, and very warm. Arthur and I had a few shows booked in Manhattan, but first we checked in with Sean on the set, where shooting was well underway. Sean is great people, exactly the kind of guy you'd hope him to be from his movies. Very passionate, very intelligent, very funny. That first day in the trailer, he was having a tattoo spray-painted over, getting ready to shoot a scene. He was mighty buffed, and trained daily. He looked over at us and said, "Well, boys--I don't have to be on the set tomorrow until 2 p.m.," and flashed a diabolical smile. I told him that we just had a little gig that night, an early show for an hour, at 9. "No, that's no good," he said, and asked his assistant to hustle up another gig for us that night. Within a few calls, she had a gig at midnight. "Good, okay--make some calls, let's get some people out" her boss said. I took a look at the call sheet, and it was pretty funny. Rock stars and actors, writers, promoters and publicists, shakers and movers of various kinds, personalities. "Can I have a copy of that list?" I mused. "Yeah, sure, Frank--in your dreams," Valerie smiled. Long, long story much shorter, at that gig and another to come, a number of cognoscenti attended first our duo show and then one with a band of Nashville cats. Besides our host, Al Pacino, Tim Robbins, Catherine Keener, Sean Lennon and Elizabeth Jagger, James Gandolfini, David Blaine, and many others shared the music and our host's passionate appreciation of Arthur Godfrey's art. The very best stuff are the private memories of both of us playing our songs for Sean Penn and his friends in late night hotel rooms and movie trailers on midnight set, moments we'll both treasure always. We ended up spending most of that summer in NYC. My brother Jon was managing Arthur by then, and he'd rented an incredible loft in Soho where we were working on his career. Arthur got his picture in the Rolling Stone with Sean, and we combined his first and second CDs and recut a lot of tracks off the first one at Puremusic Studio in Nashville. The result is his latest and greatest record, Amen. The title cut is the one that won Arthur the John Lennon Songwriting contest for the second time, in 2003. And this time he was the Grand Prize winner of the whole contest. Arthur and I were both invited by Tim Shriver to play at the Kennedy compound over this last July 4th holiday, and we were joined by the great Country singer Joy Lynn White. Martin Sheen and many of the Kennedy family were in attendance at the informal shows in the living room of Tim and Linda, and at Ethel's house. Again, we were treated with the utmost consideration and friendship. Dinner with Eunice on my right and Sarge Shriver at my left is not something I'll soon forget.